When people hear talk about public contracting, most assume the work is related to paving roads and building bridges. 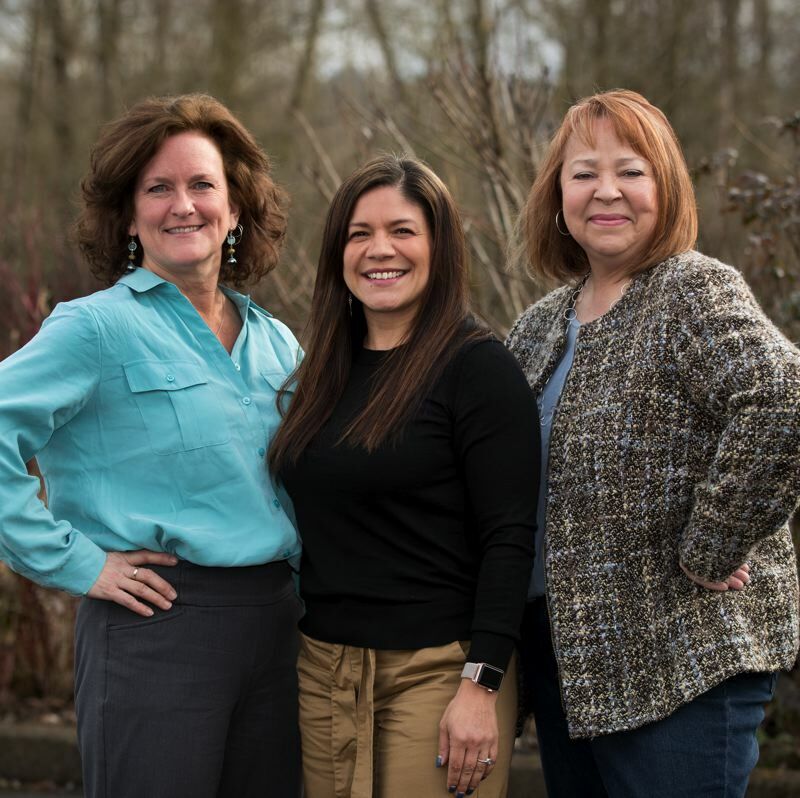 However, Eloisa Miller, Carrie Baxandall and Ruth Miles say the opportunities to provide goods and services to public agencies at all levels of government in Oregon go far beyond construction, architecture and engineering. From haircuts to guitars, state and local agencies need the types of goods and services that Oregon businesses owned by women, minorities and service-disabled veterans as well as small emerging companies and firms can provide. With the aim of helping spread that word, Miller, Baxandall and Miles are preparing for the upcoming Governors Marketplace, to be held March 20 and 21 at the Salem Convention Center. Now in its 15th year, the Marketplace offers an opportunity for small businesses to learn about contracting with public agencies. Educational sessions also provide information on business development and how small emerging businesses and businesses owned by women, minorities or service-disabled veterans can become certified in the state's COBID program. Miller, the economic and business equity manager in Gov. Kate Brown's office; Baxandall, manager of the state's COBID program offered through Business Oregon: and Miles, a tribal liaison and small business advocate in the Secretary of State's office, sat down with the Business Tribune recently to discuss the opportunities small business owners will find at the event. The conversation has been edited for brevity and clarity. Business Tribune: In the simplest terms, what is the Governor's Marketplace? 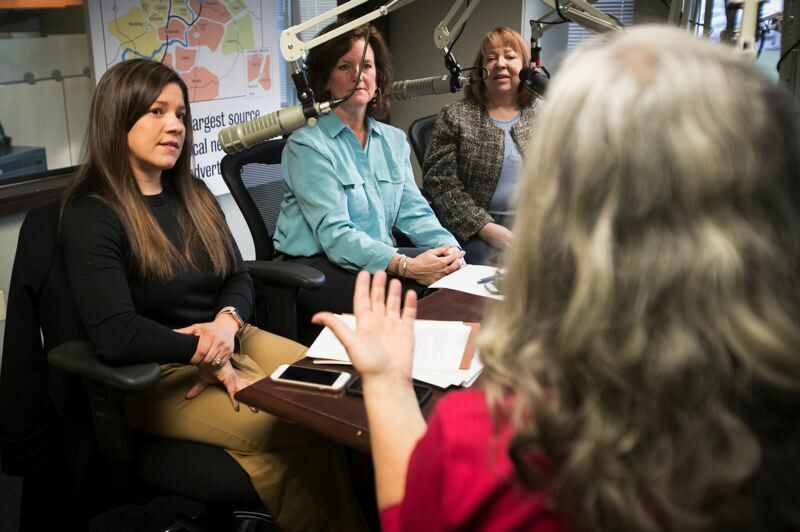 Eloisa Miller: The Governor's Marketplace is a gathering of agencies and cities, counties, school districts, large-private firms, lenders — (that are) all there to bring their opportunities and resources to the small business communities ... This is our second year with two days of educational sessions and then also the Exhibitor Fair on March 21. It's such an important conference for folks to be able to come in and learn from each other and not just for the small business communities, but also our agencies are learning, our lenders, everyone who comes to the table can get something out of it ... we're learning more, we're able to give more and we can help each other and collaborate and partner together even better. BT: Is the event for a designed for a certain type of small business, such as those that have been in operation for a certain number of years? Carrie Baxandall: I encourage all businesses ... from any stage (to attend). It could be a startup. I recently had an email from somebody thinking about going into business and she asked if it was something that she should attend. And I said, absolutely, because it isn't only built for introducing public contracting opportunities, but it is about the resources. It's about how to start, how to sustain your business, and then also how to grow and thrive. We have so many elements built into this that it captures and includes information for any business. Ruth Miles: I think one of the most important things about the Governor's Marketplace, aside from the classes that we'll have, is connecting to government entities. It's about networking and ... for any business to be successful, that networking is so important, that putting a face to a name and shaking hands and introducing yourself. The emerging theme of the Governor's Market Place this year is connection. Networking can be a scary word. So, I want to be careful in the way we use it because, really, what this is about is authentic communication and facetime between people, some of whom have these multimillion dollar checkbooks and are desperately seeking COBID-certified firms or those small firms that maybe are eligible to be certified and don't even know that it's a thing that they can do to help with their business. BT: If I'm a small-business owner and I walk into the Salem Convention Center during the Governor's Marketplace, what am I going to find? BT: According to the agenda, Gov. Kate Brown will speak on the second day. You also have Stephen Green listed as a keynote luncheon speak. Can you tell us more about him? BT: The second day of the Marketplace features an Exhibitor Fair. What sort of features will that offer attendees? Miles: We've got over a hundred vendors right now, many of whom are actively looking for these (COBID-certified) firms and then a bunch of firms and organizations ... One of the things that I think goes unknown is just how much money the government has to spend. Agencies truly want to keep the dollars here in Oregon, but they have a really difficult time finding firms to meet their needs. And when businesses think about government contracting ... they tend to think about construction. It's not just construction, it's anything you can imagine all the way from ... lanyards to guitars. BT: Lately, there appears to be a greater effort in Oregon to shine a light on equity and inclusion with regard to public contracting. Can we talk a bit about that effort at the state level? Miller: Last year, for the 2018 Marketplace, Gov. 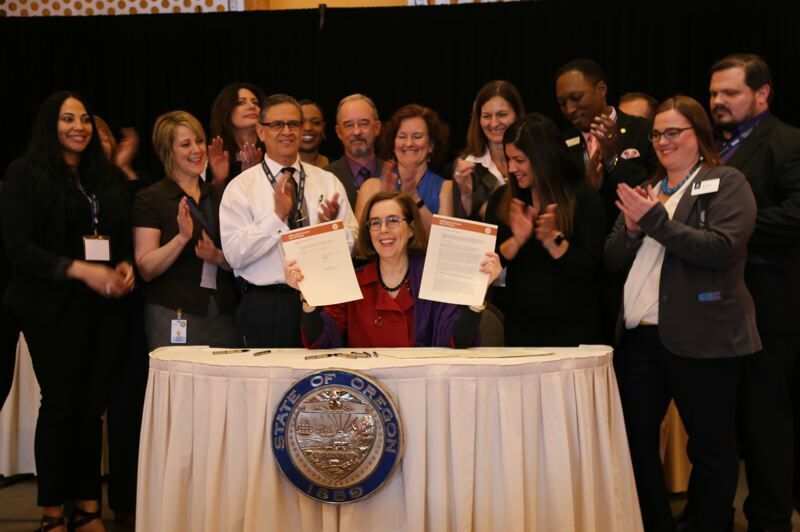 Brown did sign an executive order ... to promote equity in public contracting and that calls for all of our agencies to increase utilization of COBID-certified firms. So, what that means is that we need businesses to come to the table. We need them to meet us halfway. We absolutely cannot move Oregon forward on the front of business owners being successful unless they meet us halfway. We're really doing our work on the agency side to give them more guidance on how to engage with small businesses ... However, we are looking at a very small pool of COBID-certified firms within the state as compared to how many business owners are out there. So, if we don't have our businesses meeting us halfway to do this work together, they won't see movement, (and) we won't see movement. I just really want to express to business owners to participate in any way that they can, the Governor's Marketplace being one way for them to learn all of the benefits of public contracting. BT: Many owners feel they can't afford to be away from their small businesses for a day or two. What would you say to those who may still be on the fence about attending the Governor's Marketplace? Baxandall: Business owners have a huge opportunity here if they're willing to be bold and (attend the Marketplace), even if it feels a little uncomfortable. I can't tell you how many times I've talked to folks who are business owners, who come to the Governor's Marketplace, and they say to me at the end of it, "I didn't really know what I was here for. I really honestly took a leap of faith and I, I was a little bit resentful of that time away from my business, but I had no idea." Because this is not about government telling business owners how to run their business ... We've gathered the very best experts, resources and partners that we know of for businesses and pulled those people all together so that they're in one place physically. And that opportunity to make that connection, that authentic connection that will survive well past the conference, is there. Miles: I think it's really important also that folks know that there isn't any door that's not open. They'll find that when they attend, they'll see that there are others that have the same needs as they do. We want people to know that they have partners that are already there — they just have to reach out and make those connections. They really aren't alone.